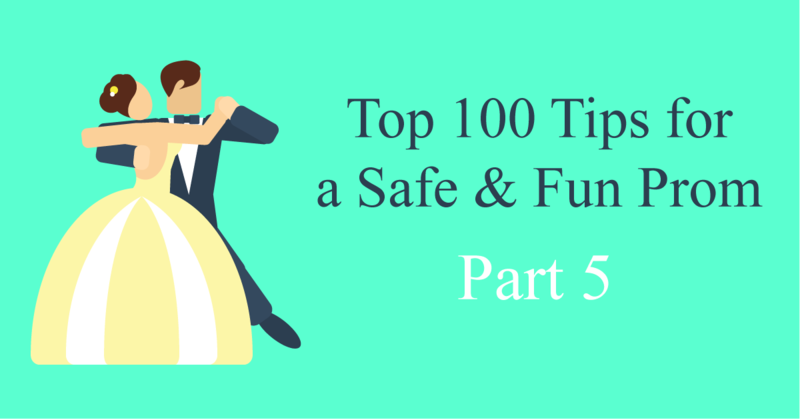 This is part five of ten covering the 100 top tips for a safe and fun prom. Each week, we will count down to the most important tips to have the safest and most fun prom possible. As a partner to more than 140 High Schools in the greater Philadelphia, PA area, Kevin Smith Transportation Group is the #1 preferred Prom Transportation company. Are you looking for the #1 Prom Transportation company? Call 610-222-6225 and speak to a Prom Coordinator at Kevin Smith Transportation Group who can walk you through all of the vehicle options and pricing packages. Prom safety is something every parent, student and High School focuses on and here at Kevin Smith Transportation Group, we believe it is our responsibility to deliver the safest experience possible for the more than 140 High Schools that call us their preferred Prom Transportation company. However, we also want to deliver fun and our fleet of Limos, Party Buses and Prom Sprinters are ready to provide the most amazing experience to every student attending prom this year. With that in mind, we are counting down the top 100 safety prom tips as shared by leading safety experts. Here are tips 41 to 50. One week away from prom – Talk to your teen and tell them their safety is your biggest priority. One week away from prom – Ask your teenager if they have any concerns or apprehensions about prom night. One week away – Ask if there have been any changes to the post-prom planning that you should be aware of. One week away – Let your teenager know that you understand there are a lot of pressures and fears about prom night and you are there if they want to talk about anything. One week away – Start to plan your own sleep schedule. You are likely going to be up late so you are available. Chauffeur instructions – Speak directly to the Chauffeur and remind them that the safety of all of the teens if their responsibility and the expectation is a drug-free and alcohol-free environment. Chauffeur instructions – Remind them that there are to be no stops outside of the booked itinerary. Chauffeur instructions – Request that if they have any concerns during the trip that they should pull over and speak to the teenagers. Chauffeur instructions – Make sure the Chauffer has the contact information for a primary and backup parent in case there is any issue during the trip. Prom season typically lasts nearly 3 months, starting in early March and ending in early June. From a transportation perspective, it also clashes with a very busy wedding season. To ensure you get the perfect Limo, Party Bus or Prom Sprinter, book early. Even if you are still working on finalizing the group who will be coming along, locking up the perfect vehicle ahead of time is the only way to ensure your transportation is as amazing as the prom itself. Use the search box below to find your school in the list of more than 140 High Schools that Kevin Smith Transportation Group works with.